I shot the image below with a Canon 5D Mark III in Manual mode using a 70-200mm f/2.8 lens set at 200mm, 100ISO, 1/500th and f/3.5. I am going to share all my mistakes below the image. I am a professional people photographer who photographs people in controlled settings both inside and out. In other words, I shoot in manual and control the lighting both inside and out to make it work for the set up that I am using with strobes, reflectors, etc. 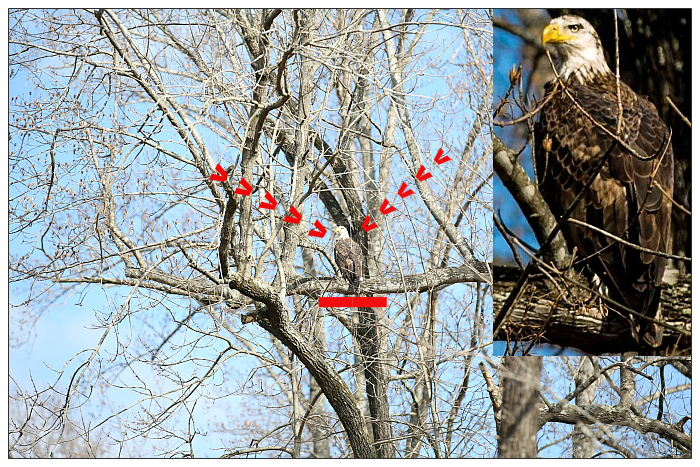 Photographing an eagle in nature on manual was not a good decision. In addition, I had my camera set in two other classic people modes that I use which were not good either. I should have set my camera to aperture priority mode or shutter priority mode. However, I would have chosen aperture priority mode over shutter because the shutter speed would have been fine if my ISO and f/stop were in line. I had my camera in manual, grabbed it and started shooting. My image was overexposed; however, there were other issues as well like Mistake #2 and Mistake #3 which are two other settings that are usually fine with my people photography but not so good with a flying eagle. Yep, the eagle took flight and I was not ready. I like shooting with the 70-200mm at f/5.6 at this distance. I was at f/3.5 which was not the biggest problem that I was up against. I would like to have been at a faster shutter speed than 1/500th for the flight that took place but at 100ISO stopping down to f/5.6 would have lowered my shutter speed. However, that would have gotten the exposure more in line. I could have gained two f/stops by shooting at 400 ISO and three f/stops at 800. So if I had it to do all over, I would be in aperture priority mode at f/5.6 at no less than 400ISO and maybe even 800ISO (to some that may sound odd for outside). I should have been on Continuous AI SERVO mode. That is the best mode for moving subjects and action. The Canon 5D Mark III has 3 focusing modes: One Shot, AI Focus and AI Servo. I tend to stay on AI Focus which is supposed to select the right focusing mode even for action; however, I have found that when trying to photograph action that AI SERVO is best: The camera is constantly focusing. The eagle took flight and I ended up with ZERO usable images most of which were OUT OF FOCUS. I had a FANTASTIC one with a beautiful full wing span at an angle but between manual settings and the wrong focus mode, I cannot show it to you here. In addition, Mistake #3 factored in when the eagle took flight. If you read Mistake #2 before reading this, you know that the eagle took flight and I was in the wrong focus mode. Well, I was also in single frame mode but at least I was on silent rather than the shutter being noisy. The Canon 5D Mark III will shoot 6 frames per second. There are other less expensive cameras that will do more frames per second, but the 5D Mark III is a full frame pro camera. I'll take less frames per second for the trade off. I should have been in continuous frame mode which with the continuous auto focus that I should also have been in would have helped when when the eagle took flight. That was an AWESOME full spread shot but between Mistake #1, #2 and #3 all combined, I cannot post the shot here: Too Bad!!! FYI, I do offer photography workshops in the Raleigh area and one-to-one training. I don't offer training on how to photograph eagle's in flight. I am still working on that one.